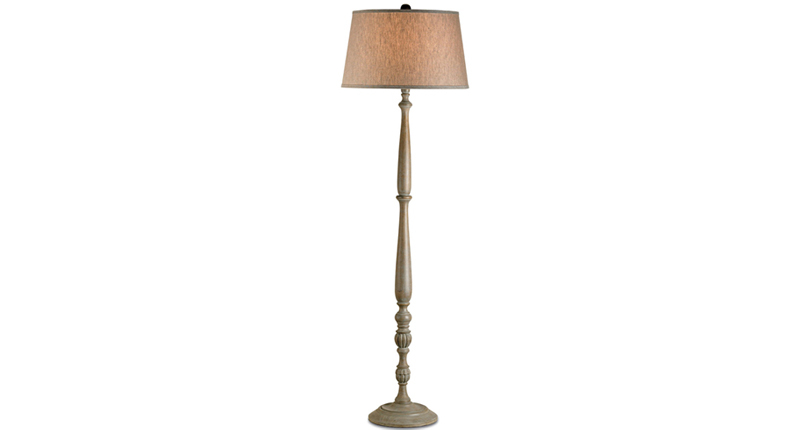 Whatever is your home style, a rustic floor lamp would be a timeless option. One glance on this list and you’ll know that you will be seeing another list of lamps from Home Design Lover, and you might wonder why. Well, for starters, lamps like most of the furniture and decorations pieces we have out there comes in a lot classes, designs, material, finish, color, shape and so many other categories you can think of – here, we would like to compartmentalize them for you to have that particular category available to you when you visit this site. I guess it’s also a smart and easy way to create lists that would cater to different likes and you’ll have easy access to it. 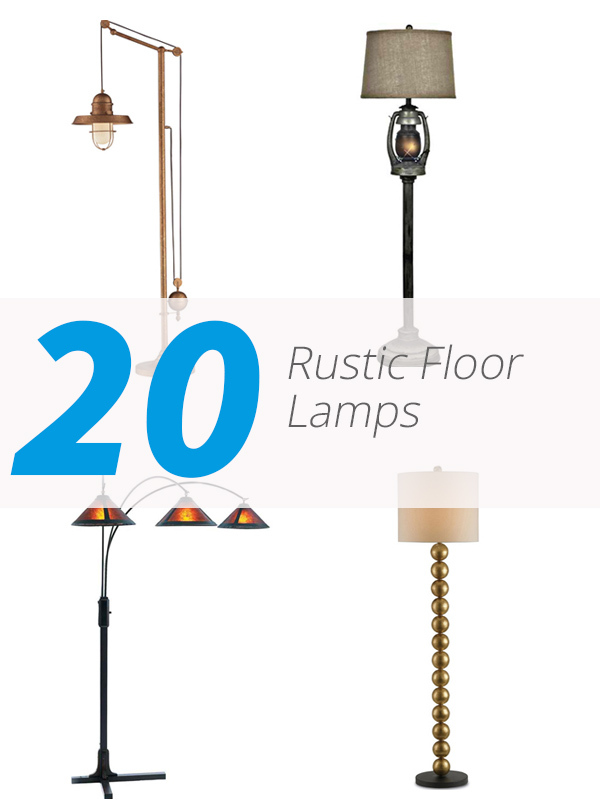 To start off this happy Monday, we have a list to show you – a list wherein we are able to see how designers and manufacturers create for us a certain look and feel, today in particular, we have in here something that says ‘A Modern Approach to 20 Rustic Floor Lamps’. The designs are of course contemporary but the main goal is to actually use them for spaces that want to achieve a more rustic theme, more industrial or even mid-century. I’m sure that you’d find this list interesting because of the wonderful designs this list offers, take a peek! This is one awesome floor lamp! Take a look at the cool system it has with a hanging industrial light and the whole wiring that seems like a pulley of some sort. The finish of this bellweather lamp is just something all rustic lovers would really love. This is one gorgeous floor lamp! The color is this one is really beautiful and vintage-y; the design and the detail on this one sure make it rustic and industrial all at the same time. The Acanthus accent of this lamp somehow makes this its special feature. It is pretty and sophisticated. The finish on this one is quite lovely and would actually fit a home both vintage and rustic. The drum-like bronze top of this floor lamp looks like it has a bit of a film reel detail in the middle; the design is contemporary and awesome too! Plus notice that the color of this drum is really pretty. 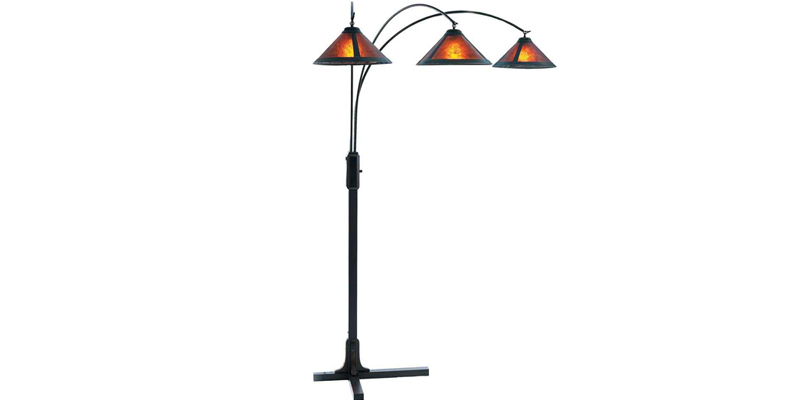 This rustic floor lamp is really fun-looking. The light is covered in this circular cage and this one sure is ideal in your living room and it sure will complement any space because it is in black. An awesome floor lamp with a vintage body and a contemporary head – pretty classy and regal for a lamp, don’t you think? Take a look at the bottom part of the body of this lamp, it sure resembles a body of a candle holder, right? A contemporary approach to lantern-type lamps; this sure has a nice design which is actually a little Asian. You know those lamps that you see Asian people bring when they are in a dark place like a forest or something. Never been to Liverpool but this lamp sure doesn’t look like liver either. Haha! Kidding! This is one awesome floor lamp piece! The body is quite an interesting form. According to what I’ve checked, Mica is a type of colored or transparent mineral silicates crystallizing in monoclinic forms that readily separate into thin leaves; now, I can say that this mineral sure did a great job in this case – the color of the lamp shade quite surpasses any rustic lamps out there! There sure are people who likes cognac, and for good reason. This lamp sure has that kind of charm a cognac has to its drinkers. This lamp indeed was created with class and a kick. Remember all those old-looking microphones from the time maybe Elvis was around? It sure is coming back in the music screen and so as in the lamp screen too! This one kind of looks like it; this too is quite a piece, it can actually pass for a collectible or something. Maybe it is the balls in this lamp that I like, but I’m not sure; well, for whatever reason, I like the design on this one – the lamp shade is somehow drum-like but narrower and then those gold-colored balls that are connected with one another is really pretty. I don’t quite get how this lamp got ‘swag’ in its name but I think JB Hirsch sure knows that lamp has it to be called it. Pretty awesome though. Notice the common design on the lamp shade but the detail below it is quite nice. It looks like there is a duck print or something on the lamp shade – can’t say I’m shocked or what, but this one has that fancy detail on the part holding that lamp shade. 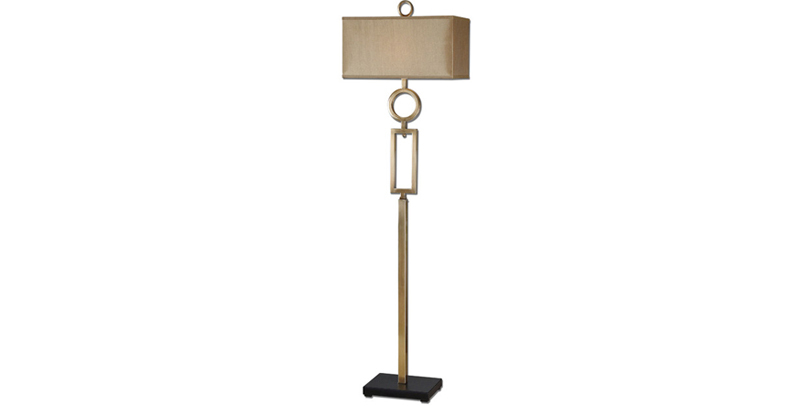 I think that floor lamps with rectangular heads and have metal bodies sure is contemporary and cool; look at this one – its body has cute details of a circle and a rectangle connected to one another. The orbital weave going on in this floor lamp is quite amusing, don’t you agree? The weave is neat and really stunning. It makes this industrial lamp really stand out! This floor lamp sure has an awesome name! Ha! The design is simple and on point. It a classic design and it sure is funky, but if you look closer on this one – this is one rustic or Mediterranean floor lamp. If you check out the works done by Franklin Iron Works, you will be impressed. Take for example this one, the detail is really pretty and somehow reminds me of Transylvania or something related to those times. When I saw this, I told my sister that it somehow is Van-Helsing kind of lamp. A contemporary-modern design of the floor lamp of your dreams! Details on the leg of this metal floor lamp can really go for an industrial-themed living room or home in general. I like the design of this lamp and when you think about it, this can actually pass as a weapon one can use for self-defense. If you think the other 19 pictures were stunning, then this one is absolutely just like them with all their bronze-ish glory! 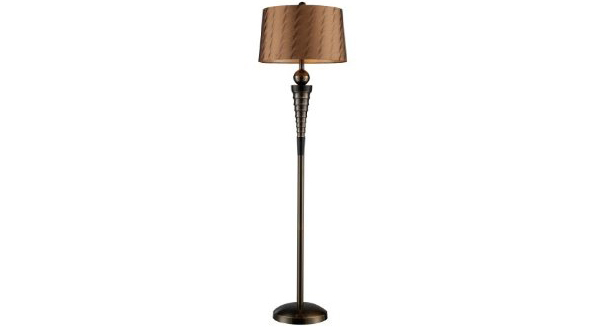 The lamp shade color and the leg detail is quite alluring and this one sure looks expensive too. If you think that list is a great start to your week, well, do check out the other list we have here that was featured a couple of weeks back. Like this list, the lamps we just shown you are made with the best materials available and with fascinating designs too! What do you think about them? They come in different with lamp shades, different colors and whatnot but the design is all spectacular!